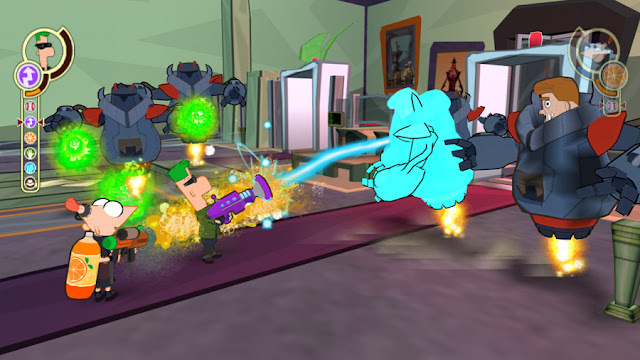 So we finally got our copy of Phineas & Ferb: Across the Second Dimension a few days ago from Disney Interactive Studios, and I've been busy playing it ever since. After seeing the Disney Channel movie of the same name about 40 times now due to having a young one who is hooked (I also like it), I feel I was ready to jump right in. Phineas & Ferb is pretty much sticking to the LEGO formula of the co-op play, with a side/top view, navigating each level towards a boss. 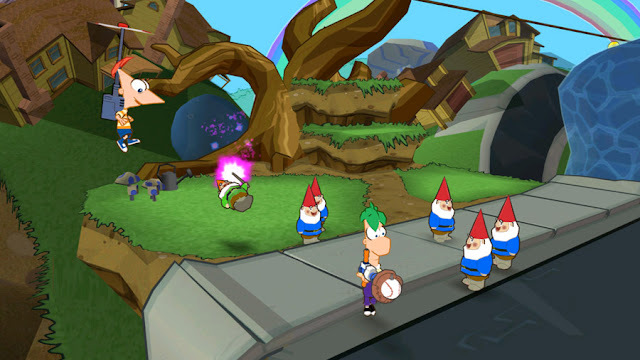 Gameplay is near identical in that regard, though you start off with just Phineas and Ferb, (if you're playing single-player, you can easily swap between characters on screen), you unlock more characters from the series as you play. There's slight advantages to each character, though it's really not important, I generally would just play with who I liked the most. The gameplay is super easy, as one would expect of a title geared mostly towards young'ens, thus making any character advantage a moot point. You can access the same weapons and tools, unlike in the LEGO franchise, you may require a certain character to solve puzzles. Levels are also really short, you can play through one in less than 5 minutes, then move into the next. Between levels they try to mix it up with some shooter elements, in the point of view of something like a StarFox or something like that. Enemies appear in front of you as you fly "on-rails" towards the end of the level. There are also two carnival-like games, between levels, that let you play their version of Skee Ball, and the Crane Game. Both are poorly executed (without the Move you have zero control over your Skee Ball that I could tell), but you do win tickets that you can use to buy modifications, trophies, etc, perfect for the in-game collector. There is a small RPG element to the game, though it's minor. As you gain more weapons, and as you use those weapons, you level them up. You also have to collect "pieces" that eventually turn into mod chips that you can modify various different aspects of the weapons, like power, recharge speed, etc. Graphics are actually really high quality. It actually feels like you're playing the TV show, animation is smooth, and at least on the PS3, the graphics are highly polished. The only exception is the in-game engine that powers some of the non-animated cut scenes, it's a little rough around the edges. Sound is great as well, for a TV show turned movie, turned video-game, and from what I can tell, they have all the original voice actors in place. Even the talking during game-play is their actual voices, and not just text you blindly skip through. This makes the overall experience feel more like you're actually enjoying an episode of the show, shoot, it fooled my wife and child! Controls with a Sixaxis are good, though the title is hyped to have Move support (it does), I find playing the platform-based games like this to be better with a standard controller. We even went out and got a Move to make sure we were able to try it out, but I quickly went back to the standard controller. All in all - if you're a fan of the show, you'd probably like the experience, but it is relatively easy, so you can bust through it pretty quickly. Mashbuttons gives Phineas & Ferb: Across the Second Dimension a 7 out of 10. 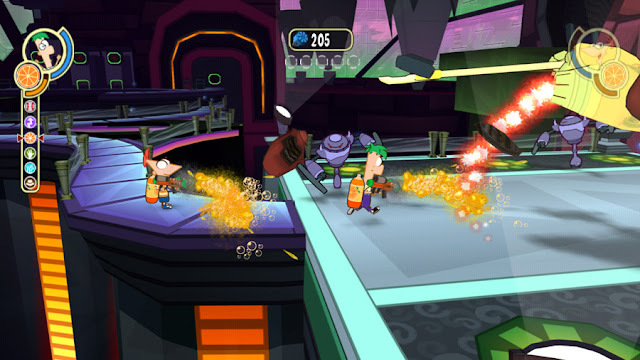 Phineas & Ferb is available now for PlayStation 3 , Nintendo Wii , and Nintendo DS systems.